There used to be a time when I would avoid turning on my computer because I knew there would be something negative waiting for me. I knew that a guest had probably left my business a less than stellar review. And it used to put me on a roller coaster of emotions. There was the stress and anxiety that other people could see the review. There was the anger and disappointment that my business had let a guest down. And then there was the rejection of course too. Today, however, I can’t wait to get to my computer and check my guest feedback and hope, that there is a bad review waiting. Am I a masochist? Do I revel in the criticisms of others? Not in the slightest, you see a bad review can be a great thing for a business. Don’t believe me? A bad review is something that you could spend thousands of dollars on, a branding expert to tell you what is wrong with your business. A bad review is a free assessment of your business that is targeted specifically at the areas that need improvement. As a business owner, it can be difficult to spot all the areas that you need to improve to make your business the gold star operation you want it to be. Viewing your guest’s feedback through this lens can take the sting out of people being critical of what you offer and can lead to your business to deliver better next time. Have you ever gone to a business page and read through their reviews and they are all glowing recommendations? As you read you begin to think that the service that business provides can’t possibly be that good. Chances are it’s not. There is not a business in the world that is going to provide the best of everything, to every person that engages them. It is impossible for that to happen, there will always be something that someone wishes were different. 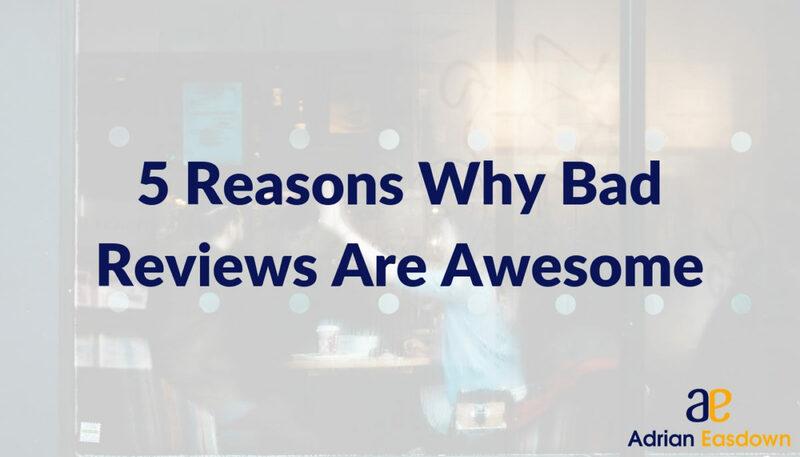 Having bad reviews, or even mediocre reviews shows that your business is real, and most importantly, that the reviews on your business are real too. Most people that are searching your business online are savvy enough to know that business can, and do, buy good reviews. This almost always has the negative effect of driving customers away. People aren’t perfect, and anyone that is coming to your business pages looking for reviews knows this. The fact is there will be times when a guest coming to your business will have a poor time. Once that guest leaves and then writes a review of your business there isn’t much you can do about it, right? That’s where you would be wrong, even though that guest has left they have given you one more opportunity to demonstrate to them that they are mistaken about your property. Responding to a customer review and demonstrating to them that you have acted on their specific situation and that you have listened to them can end up turning that negative experience around. There have been times when the response given to a customer has resulted in that guest returning to a business. Not to mention the other potential guests that are able to see that you do care and that the situation that occurred was a one-off. There is something to be said for showing the world who you are, warts and all. The first instinct when a bad review is left for your business is to find a way to hide it. The fear that bubbles up inside tells you that it is going to turn people away. The reality is, it shows to your future guests and those that interact with your business that you are honest. You’re not afraid to have someone say something negative about your business, you know you’re not perfect and that’s OK. You are taking a guest’s feedback in stride and inviting other guests to be honest as well. If you respond to the feedback that is given to you, then you will build trust with your guests long before they arrive (as ignoring it can show that you don’t care what people think at all). This trust will give you an opportunity to mould your guests into the type that will be open with you during their stay which will reduce the odds of them leaving dissatisfied. When a review is left for your business that casts it in a negative light, it opens a dialogue. The most obvious person this dialogue is with is the person that left the review for you. But this only represents one person in that conversation, you are also having that conversation with all the other people that come to your business and read that review, and most importantly your response. There may be a review that is left for you that has occurred through no fault of your own. The guest may have had an incorrect expectation of what your business offers and allows, or was operating outside of the policies that you manage your business by. By responding to a guest and addressing their concerns you address the review that was left for your business, thereby highlighting where the issue was. At the same time, you’re also advertising to future guests who may also have the same incorrect expectation about your business – this heads off the same thing happening again. Bad reviews, when framed a certain way, are gifts. Guests have taken time out of their day to show you where you can improve and grow your business. You would be making another mistake to not listen carefully.